THIS month a big-screen version is to be released of a classic children's adventure story - Swallows & Amazons. It is based upon the 1940s stories of Manchester Guardian war correspondent (and MI6 spy come Russian sympathiser) Arthur Ransome. The bespectacled and unprepossessing Ransome, a Yorshireman with a public school upbringing, liked nothing better than reclining with his pipe amid northern English countryside. Yet he also made pals of both Lenin and Trotsky through revolutionary times. 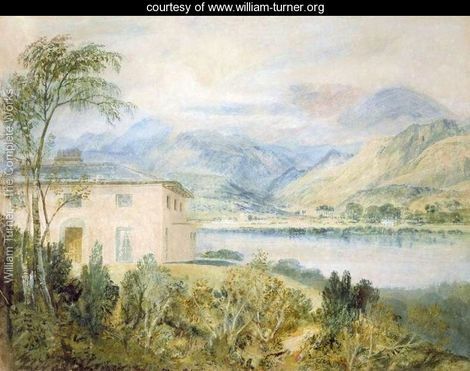 By contrast, he set his story mainly in the English Lake District's Coniston Water, much beloved by Victorians (see painting by Turner, above). Roy Edmonds writes . . . She Who Knows and I discovered and regularly visited the source of his inspiration, at Bank Ground farm - run by a widowed dairy farmer in her late 80s, Lucy Batty. We regularly stayed in Mrs Batty's guest rooms (pictured below) and revelled in leisurely spring walks through the wooded fields, or steam-ferried boat trips on the breathtakingly beautiful lake. In the end, Ransome decided to write his gentle adventure stories at home, rather than become a Berlin correspondent and meet Hitler and his hell-bent cronies. So, thankfully, the world and countless children shared his healthy passion for thrills and spills in the Great Outdoors. 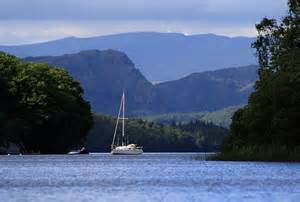 To be truthful, my favourite sailing has always been on lakes rather than the perilous sea. I didn't need gales and waves to feel the thrill of a full sail as my dinghy cut silently through gleaming waters - with the shore still reassuringly close. Through work, I travelled much of the world alone but, as in many adventurous pursuits, found the greatest satisfaction in writing about it later, safely at home. Others may be driven by gentler or stronger winds. We're all different but share the same interests, as the diverse readers of this light literary website prove - from Russia to South America, or the Philippines to Germany. Sometimes, it seems to me, we find more truth and meaning in art than in day to day life, which it reflects. On this website we have pages to entertain and delight you, fiction and non-fiction; romance, mystery and humorous memoir with a touching humanity. Books for further reading come on Kindle and in paperback, sponsored by the British Arts Council, to help support this non-profit making website - intended to amuse and uplift your spirit in quieter times. Fortunately, wherever we venture, or rest, we're never entirely alone - not if we have faith in goodness. May God be with you, dear readers, on your adventures . . .